Tour the restored home of Illinois Governor Richard J. Oglesby. Encounter the lives of its family members and explore their late 1800s lifestyle. Fee $2. Members are free. 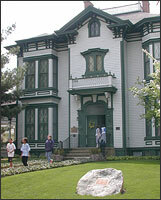 The Oglesby Mansion is located at 421 W. William St. in Decatur, IL.